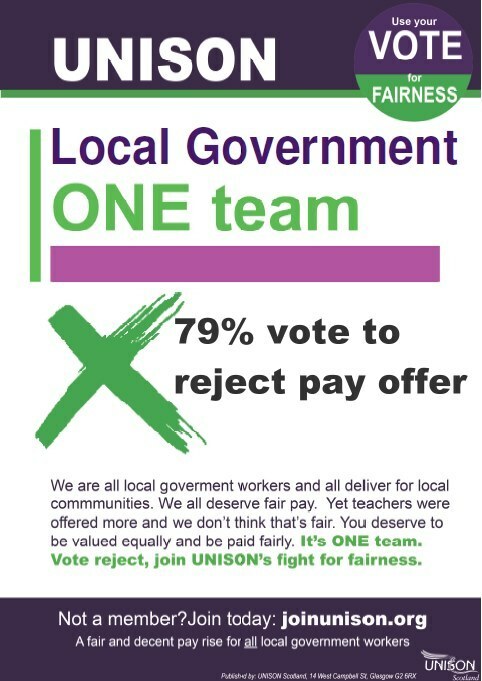 UNISON Scotland’s local government members have overwhelmingly voted to reject their employer’s (CoSLA) pay offer of 3% for workers earning up to £80,000, and to move towards strike action in support of their claim for fair pay. UNISON will now start to take steps towards strike action. The local government joint trade unions – who have also run consultative ballots of their members – will meet with CoSLA to inform them of the results of their ballots on Friday 9th November. Mark Ferguson, chair of UNISON Scotland local government committee said: “UNISON members have overwhelmingly rejected the 3% pay offer. They do not think it is fair that the Scottish government found £38m extra to put into teachers’ pay, over and above their cost of living increase, but they have offered no additional money for low paid local government workers. Johanna Baxter, head of local government (bargaining) said: “What this result demonstrates is a real anger and frustration amongst UNISON members at the lack of action by CoSLA and the Scottish government to address the serious issue of low pay in local government.